I have had experience with several online marketplaces. When I was a teenager working in retail and addicted to shopping, I went through a halcyon phase of selling regretful purchases on eBay. The proceeds generally went on to be used in further questionable transactions - it was pretty much capitalism at its finest. When I decided to move out of home, I searched for and eventually found my inner-city share house on Gumtree. The fellow occupants of this share house did not murder me in my sleep, so I’m gonna go ahead and call it a success. 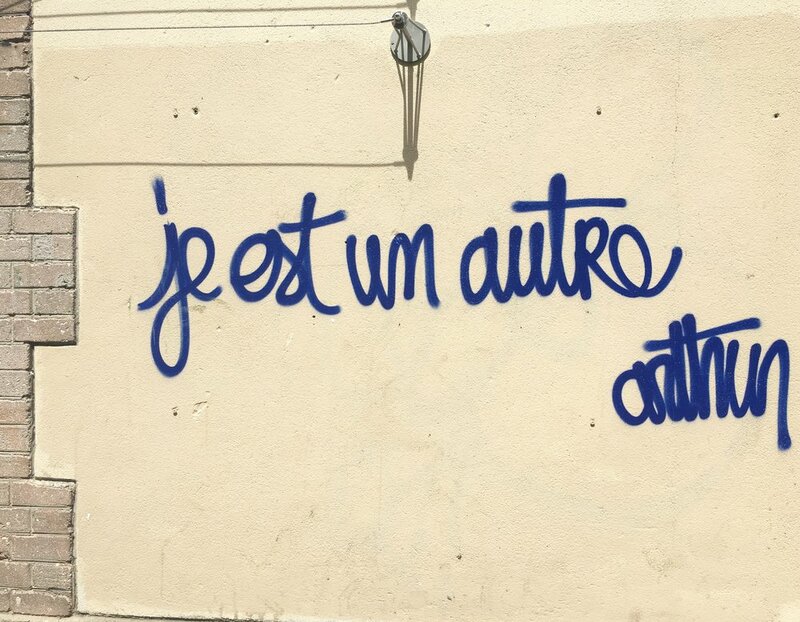 When I arrived in Paris, I had spent the previous three years in a furnished apartment. One of my goals was therefore to take an unfurnished apartment and make it my own. When I decided to leave Paris and move to London - where I would move in with my boyfriend - I was obliged to part ways with the majority of the furniture I purchased. In my time of need, I turned to Le Bon Coin. Le Bon Coin - the world’s most random online marketplace? 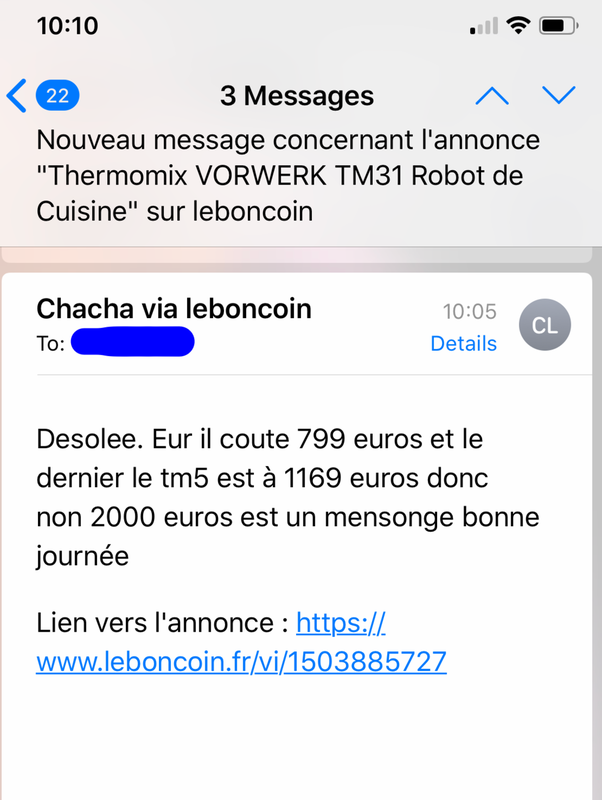 Le Bon Coin is the French equivalent of Craigslist. At first blush, it appears a seller’s paradise. To begin with, it’s free to post items for sale. What’s more, it appears that the French population at large is yet to discover the art of product photography, making it easy for any decent photos taken on an iPhone to instantly stand out (Editor’s note: I had the same experience trying to find an apartment on Se Loger). However, over the course of the month or so it took me to sell all my unwanted items on Le Bon Coin, I realised that the platform was far from the walk-in-the-park it appeared to be. Is it just me, or is Le Bon Coin the world’s most random online marketplace? OK, so it’s 2018, and pretty much every online platform is rampant with SPAM and scam bots. Le Bon Coin is certainly no exception, with a little bit of typically French flamboyance thrown in for good measure. Here are some of my personal faves, dutifully screen-shotted for your personal enjoyment. “Excuse me, after having contacted several buyers I’m no longer sure which is which is which. Please send me the link to your item. I personally believe that you could take the world’s most valuable item - say, a Maserati - put it on Le Bon Coin for 10€ and you would still get 50 emails from jackasses saying “I’ll give you 5!”. When I posted my Thermomix (a sophisticated - and expensive! - feat of German kitchen-appliance-engineering) for a heavily reduced 500€, my patience pretty much ran out when I received the following offer. You can perhaps forgive my sassy response to my dear potential customer, Chacha. No, sorry. It’s a top-of-the-range food processor. I paid more than €2000. There were many things I expected when I signed up to sell my used furniture online, but being called a liar certainly wasn’t one of them. So you can imagine my surprise on seeing this reply. It is a truth universally acknowledged that free stuff brings out the worst in people. I guess it should hardly come as a shock to me, then, that the cheapest of items attract the flakiest of buyers. When I first started out on the Le Bon Coin, I carefully separated my items into two categories: “to sell” and “to discard”. There were some items that were borderline, and my ironing board was one of them. In the end, I decided to offer the ironing board at a ridiculous price (5€!) with the philosophy “if it sells, it sells; if it doesn’t, it doesn’t ”. Already, I found it hilarious enough that I actually went to the effort taking a styled, depth-of-field photograph of the ironing board, and even went so far as to process it in Lightroom. But that was only the tip of the iceberg in terms of time wasted selling my ironing board for 5€ on Le Bon Coin. The first potential buyer told me she was interested, but that she “preferred to see the ironing board first to see if she liked it”. I had been asked the same question about my Bolia couch, but given the fact that I was selling that item for 500€ I found this more understandable. As for what there was to like or dislike about a 5€ ironing board, I was somewhat less certain. The good news is that I re-posted the 5€ ironing board and ended up finding another buyer. Although I did have to hold back a groan when it came to handing the item over to her. I decided to save her the effort of carrying the ironing board down five flights of stairs, and did it myself on the way down to let her into the building. When I handed the ironing board over at the front door, it became apparent that the lady had expected some sort of demonstration of the functionality of the 5€ ironing board. She gave me a dubious look and asked me “does it work?”. When you’re selling things online, sometimes there are particular items that unexpectedly strike a chord with people. Back in my eBay days, I remember agreeing to sell a pair of leopard print gumboots for a friend who had purchased them for $1.99 before they gathered dust in her wardrobe. I brazenly started the bidding at 99c… and they ended up selling for $150! (the wonders of eBay and leopard print collectors, right?). My IKEA mirror was another such item that unexpectedly seemed to speak to people. Originally purchased for 80€, I put it on Le Bon Coin for 30€, and pandemonium ensued. I swear I received about 50 messages about that mirror, as well as a dozen frenzied phone calls. 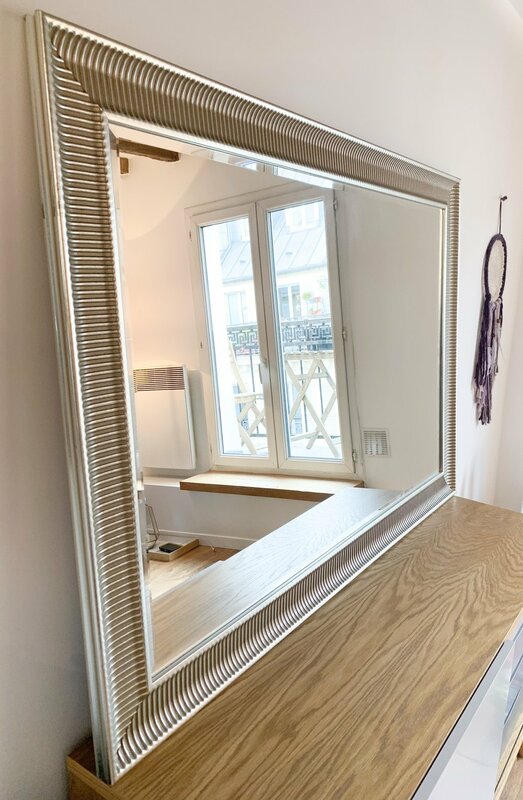 In the end I agreed to sell it to a lady called Madame Tibi, who seemed nice despite having harassed me with no less than 5 messages and voicemails about the goddamn mirror. The day that Madame Tibi was scheduled to come and pick up the mirror, I had already made plans to have a drink with a friend. He had been thoroughly briefed about my Bon Coin exploits, and made a heartwarming offer to arrive at my place early so that he could help Madame Tibi carry the mirror down the aforementioned five flights of stairs. I told him that he was being too nice, that I had been very clear about the five flights of stairs in the advertisement, and that in any case there was surely a Monsieur Tibi who would be arriving in his van as per my previous experiences with Le Bon Coin. But he insisted. Sure enough, when I received a phone call at the arranged pickup time, it was a Monsieur Tibi on the other line. He announced that he had arrived and was waiting in his car and could I carry the mirror down for him? I started sputtering, but my friend - overly nice as ever! - said, “don’t worry, I was going to carry it down anyway”. So he took the mirror and gallantly carried it down the five flights. Already there was a bit of an edge taken off his niceness when we opened the front door to see Monsieur Tibi’s car parked across the road, with Monsieur Tibi himself still comfortably tucked away inside. He wound down the passenger window before pressing open the boot and gesturing for us to place the mirror inside. My friend’s mouth was well and truly agape. “Are you going to at least get out?” he said, driven to the least-nice comment I have ever heard from him. He did, but he certainly didn’t plan on helping us. He handed me the cash and then watched as my friend struggled to fit the mirror into the boot. A corner of the mirror was still sticking out, and he looked at my friend sideways, as if to say “are you going to fix that?”. “I’ll let you straighten it,” he said, exasperated. As soon as we got out of Monsieur Tibi’s hearing range he exploded: “What the f*ck was that guy’s problem?” This then became his revised least-nice comment. So in the end I managed to sell all of my items, and all of the items in the “to discard” pile magically disappeared as soon as I set them down on the street (I mean, I swear there are people driving around in vans constantly patrolling the streets for hard rubbish, that is my only possible conclusion?). The enthusiastic response I received to the items that I posted, and the speed with which they sold, suggests to me that I probably underpriced them. But hey, the experience was downright entertaining, and I left with a good handful of funny stories under my belt. Have you ever sold anything on Le Bon Coin? What was your experience like? 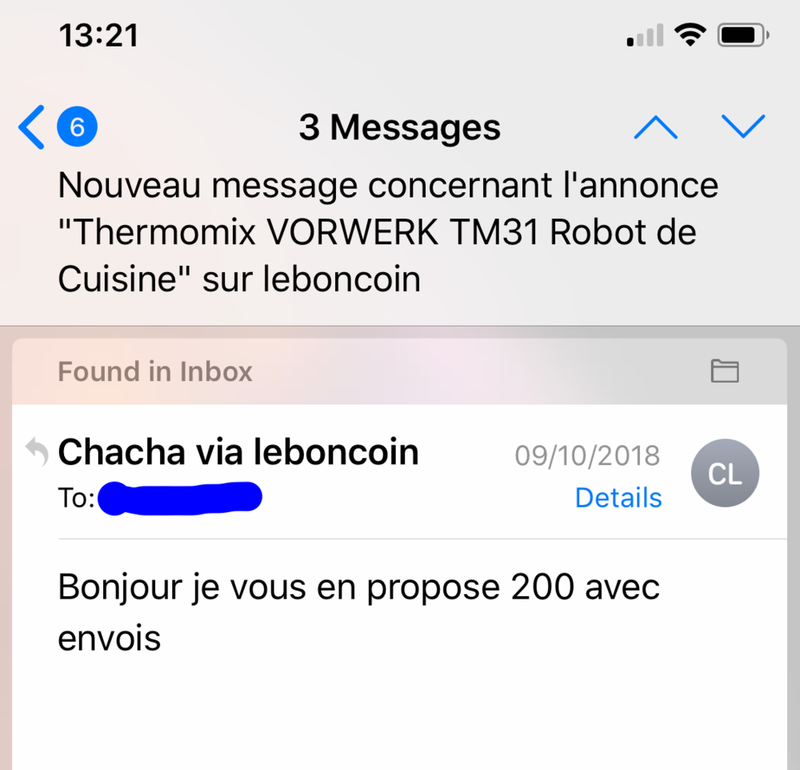 Do you think Le Bon Coin is the most random online marketplace?